Asia Musical Production (AMP) No: 60A, Jalan Bukit Raja, Taman Seputeh, 58000 KL. A total 21 hours Butoh workshop organized first time in Malaysia, a rare opportunity to deepen your understanding in Butoh fundamental elements, Butoh notation techniques, and philosophies. This workshop inspires you to investigate your own physical exploration, a way to understand yourself, and apply the philosophies into your art work creation. This workshop is based on the Hijikata method (Butoh founder), called Butoh Fu / or Butoh Notation. The workshop investigates the relationship among Dance, Body, and possession. It trains the student to explore the importance of walking in Butoh, the physical body as a medium, a person who pass through, what is craziness, the crisis of the mind and the body, and the philosophies of Butoh. From the workshop, the students will investigate the power of transformation as a fundamental element of Butoh, also exploring the different body conditions from heaviness to lightness, from condensation to expansion, relationship between space and time that is made by the body’s condition. Born in Tokyo, 1952. The disciple and main male dancer at Tatsumi Hijikata’s Asbestos-kan during 1972-1978. From this period he kept notes of the words Hijikata spoke while choreographing. These words are called “Butoh-fu”, a unique method for choreography. Waguri has made his own interpretation of these words and continues using them as a method for his own choreographies and teaching. Over the past 34 years he has taught and choreographed around the world. He is the Artistic Director of the Kohzensha Butoh Company. When choreographing and teaching, his focus is on transforming oneself to become imagery rather than depicting this through movement. With his rigid and flexible body, a good sharpness of beautiful model, and delicacy nuance, make him able to express his dance delicately. The variety of the dance, mainly base on the change of the subject, shows the new possibility of the future dance. 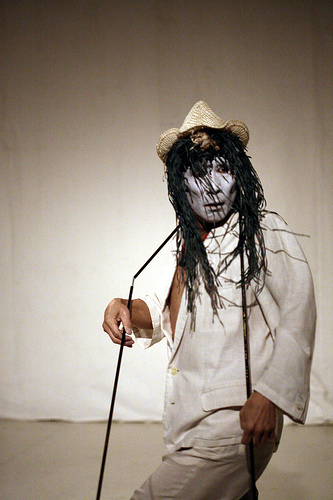 In addition, physical image rouse attention through the words, the unique Butoh Fu of Hijikata lineage; he concentrates on collaboration with the other genre artist at the same time. In 1998, he published the CD-ROM of Butoh Kaden , which has been read worldwide and receives numerous interests among butoh dance scholars and practitioners as it unveils the essence of Hijikata's Butoh notation and choreographic methods, provide an opportunity of the dance reevaluation that focus on Hijikata’s method. Registration: 1. Click “going” in this page . 2. Call Lai Chee at 010 4289 528 or email to laichee2234@yahoo.com to request for reservation. 4. Scan the transaction slip and email to laichee2234@yahoo.com or call Lai Chee to clarify the payment you have made. ** The registration will only be confirmed upon payment made. *** Venue of workshop will be confirmed later, please feel free to call Lai Chee for workshop venue recommendation, hopefully we can get sponsor for the venue.